The pale pink flowers of Paeonia Pillow Talk are refined and powerful at the same time; impressively large, sweet and satiny. 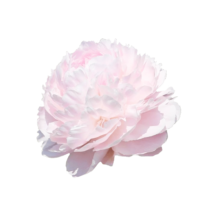 It’s one of the most beautiful peonies on the market, thanks to its sturdy stem and impressive flowers. We started with her in France in 2016. It was love at first sight. Paeonia Pillow Talk comes with a rose-shaped form. The enormous flowers are filled with thousands of pale pink petals that almost turn completely white towards the centre. Big and powerful stems and voluminous green leaves complete her characteristics. Pillow Talks pink buds can become 50 mm wide and develop into flowers that can easily reach a diameter of 20 cm. There are not many flowers with such incredible specs available. Paeonia Pillow Talk is bred by famous American breeder Roy Klehm. This variety was registered in 1973 and awarded a gold medal by the American Peony Society in 1994. This variety must be cut at the right stage of maturity to successfully open. Cut the stems diagonally and put Pillow Talk in a vase filled with lukewarm water.